"SIX OF A KIND / the WTC1-collapse assembly line"
This is because - while revisiting my vast 9/11 imagery archives - I have found yet another two "sister shots of the WTC1 collapse" - complete with, yet again, a 'timely' zoom motion supposedly performed by their respective, purported cameramen. 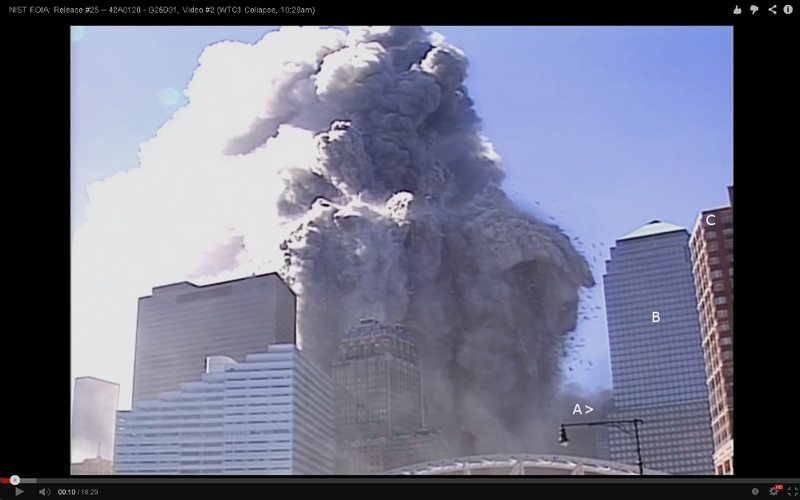 So we now have six out of six "sister shots" ALL featuring a zoom motion JUST as the WTC1 collapses. I rest my case. These are NOT authentic videos shot by REAL cameramen. To believe the contrary would require a most irrational 'leap of faith' - as one would have to accept (among other 'remarkable coincidences') that ALL SIX of these cameramen decided to perform a zoom-out motion (within seconds of each other) while shooting this most defining and dramatic "money shot" of 9/11... Good luck with that! As always, great work Simon. Allright folks. Let's see who can explain (debunk) this. 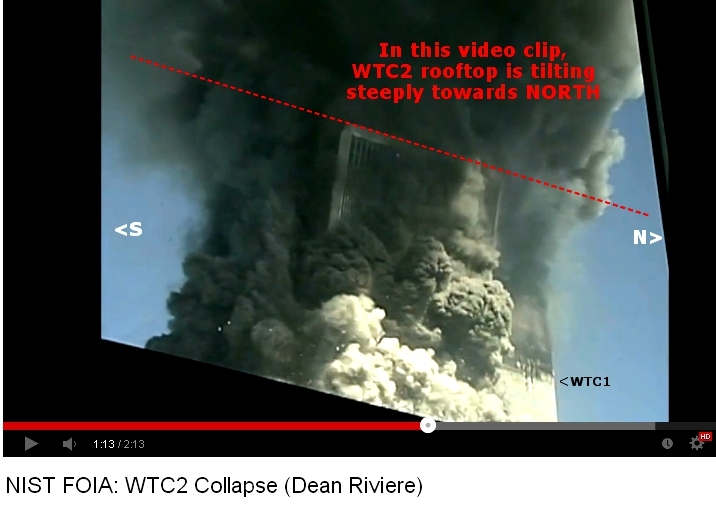 Here are three images of the VERY FIRST seconds of the WTC2 collapse - as depicted by officially released imagery (still photos and videos), widely diffused by the worldwide media for the last 13 years. At this point, I think we can confidently assert that we have demonstrated in EVERY IMAGINABLE MANNER (and I should probably do the effort to gather ALL our best evidence in one single, "user-friendly" summary) that the images depicting the World Trade Center collapses are fake. All of them. This realization should lead to the logical / natural conclusion that NO ONE was able to film these collapses - since (most probably) the WTC area would have been cloaked by a visually impenetrable military-grade smokescreen (the oldest trick in the entire history of military obfuscation tactics). 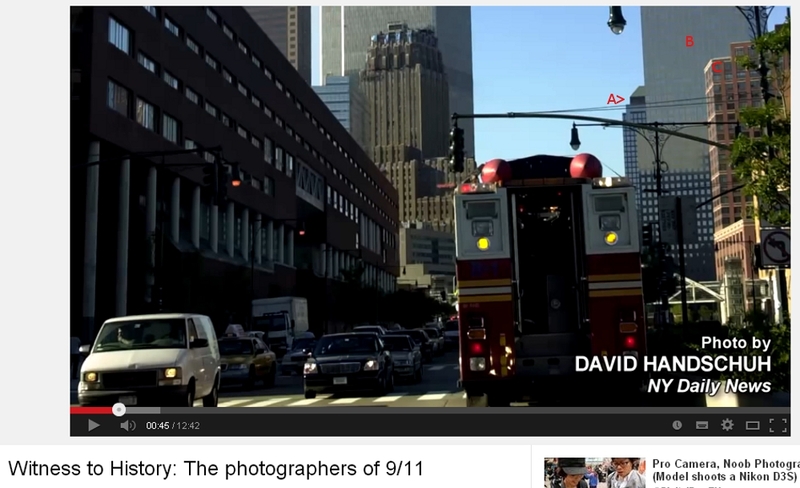 It is truly essential now to understand that the 9/11 imagery was fake - from start to finish. Yes I know, my 2008 September Clues research-documentary went short of saying that - but I now know better. Now, let us finally get this recurring question out of the way: "Hey, but what if a Joe Public armed with a camera had been filming the events of the day?" 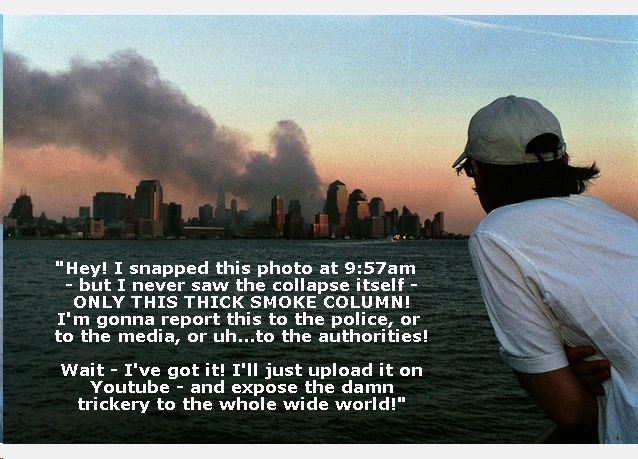 Well, Joe would just have filmed a lot of smoke enveloping the WTC area. How could Joe ever PROVE the timeline of his video material? How could Joe ever PROVE that the smoke enveloping the WTC started BEFORE the official 9:59am timeline of the WTC2 collapse? Well, he would first have to PROVE that his camera's time-settings were accurately set! Good luck with that, Joe !!! And to those still wondering: "Hey, why did no private photographer capture on film the 8:46 and 9:02 timelines of the plane crashes? . Well - the short answer is: they simply did not take place. Was WTC7 possibly the day's 'smoke generator'? As my readers will know, I have long theorized that - in order to pull of the 9/11 hoax in bright daylight (and fooling all onlookers) - a dense military-grade smokescreen was raised around the WTC area BEFORE the towers were brought down (with safe / 100% reliable conventional demo explosives). Now, theories are all good, but they are better if they can be supported by plausible & feasible explanations as to how exactly this smokescreen may have been technically / logistically achieved. So allow me to submit a little illustrated essay which, hopefully, will make sound sense to everyone. Now, the official story claims that WTC7 (the 47-story building which was located right in front / North of the twin towers) caught fire due to falling debris. I remember reading somewhere that WTC7 (allegedly) had "a large, autonomous power plant driven by diesel fuel" - and that these large diesel tanks were ignited and caused all that smoke gushing out from the back (South side) of the WTC7 building - FOR THE ENTIRE DAY... (Well, if you can buy that - you can buy my crappy, old little Fiat car for $500.000!). So, let's get real now: WHY was this bizarre "burning WTC7" story included in the 9/11 script? And why was WTC7 demolished only in the late afternoon? Knowing that the very few WTC7 tenants included the US Secret Service and Mayor Giuliani's "New York City Office of Emergency Management", I would suggest the following: surely, if (a few dozen?) smoke generators were used to engulf LOWER MANHATTAN in a 'fog of war', WTC7 would have been an absolutely ideal place to ... place them! Now - please understand: I am not saying that the above imagery is real. What I'm saying is that it was prefabricated (pre-planned by the 9/11 hoaxers) in order to depict something which would look close enough to what ACTUALLY would take place that morning, IN REALITY - as per their plan. That is, a bunch of military smoke generators blasting smoke out of the Southern façade of the WTC7. feature movie "9/11" which, of course, was presented to the public as a REAL LIFE documentary. 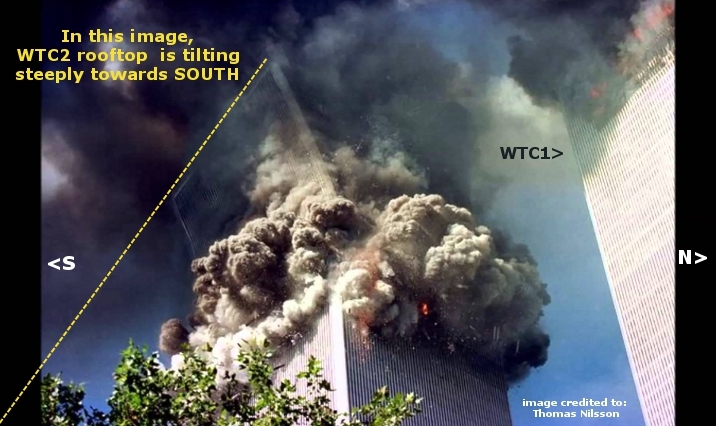 Of course, the above NAUDET scene is absurd in itself : the smoke appears to seep out of the VERY EDGE of WTC7's North- East corner !... Perhaps just a little slip up on the part of the CGI crew - who was instructed to show (animate) smoke gushing out of the back of WTC7 ? Hope all this makes sense, folks. Oh, and by the way, let me just clarify one thing: YES, I do believe Manhattan was enveloped in smoke until dusk. Lots, and lots of smoke. In fact, FAR, FAR TOO MUCH SMOKE to be possibly 'justified' by any sort of building collapse - no matter how large those building were. Any demolition job - however large - has the dust settling in the matter of minutes - NOT hours. 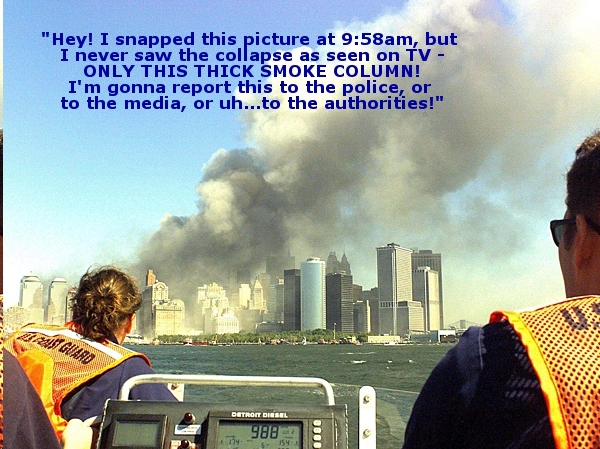 And if you should ask: "Hey, what if some dude snapped a picture /or shot a video JUST as the smoke started emerging from WTC7 - and BEFORE the first, WTC2 collapse? Would this photo/videographer not have damning evidence to expose the hoax to the world?" Well, no. A camera time stamp is totally worthless. There is NO way of proving that your camera clock was set at the correct time. No one saw with their own eyes the actual WTC collapses. 9/11 was a simple - and crude - 'smoke in your eyes' magician's trick. That's really good, Simon! I think it's very plausible. Those who may have seen smoke before the buildings were pulled would have likely just thought "Oh, now I know why I saw all of that smoke...the airplanes hit the towers!" Few would think to take a photo of nothing but smoke. Really interesting. I've also noticed that controlled opposition loves to focus on building 7 to convince people that building 7 was "pulled" but we're to believe that the towers were taken down by airplanes. I suppose it is a distraction from the truth - which is that all of the footage is fake, including the collapse of building 7. There's a story about a Yoga business in Arlington that posted something deemed "offensive" to some by advertising a 20% off sale on 9/11. The media loves public shunning these days. The story was picked up by dozens of sources. The thing that caught my attention was the fact that the poster apologized for the advertisement and then referenced building 7 immediately following the apology. Apparently the media really wants everyone to know about the building 7 "story". I think your ideas about building 7 are exactly right. "The Bikram Yoga Arlington promotion, advertised online, said, “Freedom Isn’t Free — And we intend to honor those patriots who have died for our country and morn [sic] the loss of freedom of speech and other rights that died that day.” After that statement, it offered discounts like a week of yoga classes for $40 rather than $50 and a year of unlimited yoga classes for $1,000 rather than the normal price of $1,250. Right away, Twitter users voiced their disapproval." I suppose this is also an attempt to reinforce the idea that 3,000 people died that day ... even though building 7 was "pulled" because they do not want people to ever learn the truth. I think the smoke (and fog?) generator is the only reasonable hypothesis. However, I think the generators had to be started around 8:46, at the time of the first "kaboooom", not shortly before the demolition. Since the TV images of the twin "smoking cigars" with huge gashes in them are CGI, on-lookers had to be prevented from seeing far enough to have a view of something that obviously didn´t match the made-for-TV movie. A local fog with a visibility of a couple hundred yards (far enough for the purpose of evacuation) is not a very thick fog and would not appear unnatural, given the circumstances. In addition, the fabricated pictures and videos of the event convey the false impression that people on the streets of New York have an unimpeded view of tall buildings standing several blocks away. This is simply not true. Isn´t it possible that all the 7 buildings were demolished during the morning hours? Why wait until 5:20 pm to pull WTC7? Military smoke/fog generators are typically mounted on mobile units, rather than inside buildings (could be both, of course). The entire compound was surely prepared for demolition a long time in advance and the district was cordoned off and evacuated. The alternative media´s insistence on a later time for the collapse of WTC7 could be a red herring (reinforced by the BBC "slip" of announcing the collapse 20 minutes early) ... but then, we will probably never know the answer to this question. What is for sure, according to all the research done by cluesforum members, is that there is not one single independent video or photo of the twin towers before their collapse/demolition time of around 10:00 am. So, as we now know, there are no planes that hit those buildings and we are not sure if these towers were demolished at the officially announced times. Building 7 was demolished to plant the idea that damage from the plane hit buildings was so enormous that it had to be done. Although, they (the perpetrators) of course can never explain the silliness of the idea of preparing it for demolition in the midst of all of the chaos going around at that time. The fact that BBC reported it a few minutes earlier than when it was allegedly actually demolished might have been a true error in calculation of the coordination of the times. They wanted people to see an actual building being pulled on TV on that day. And they had the rationale for why it had to be pulled. Their intention was to make it appear that WCT 7 was badly damaged from the debris of the twin towers. The hope and goal was to brainwash the TV viewers with the constant TV newscast into accepting as fact that the twin towers were destroyed due to the planes hitting them. A great proportion of Americans saw the planes hitting those buildings on TV. Didn't they? Regardless, they now have to be exposed on the facts. They have already been exposed here on cluesforum. Furthermore, their made for TV Hollywood production and the tricks that were used then will become easier to expose as the technology of detecting video fakeries becomes more and more advanced. So it is becoming as clear as day that what happened on that day was just a smoke and mirrors illusion made as a show for TV. Last edited by JLapage on Sun Sep 14, 2014 4:47 am, edited 3 times in total. I'd like to just add a few thoughts to my above '9/11 SMOKESCREEN' essay - while thanking our members Flabbergasted and JLapage for their comments - both good as I see it, in spite of some minor disagreements with the former's thoughts / arguments. 1. I would have placed a row of smoke generator pipes in the upper floors of the two Twin Towers, at the same angle & floors as the "plane gashes" shown on TV. I would have turned them on at 8:46 (WTC1) and 9:02(WTC2) respectively. To those who'd complain they never saw planes impacting the towers, I'd just say: "You must have missed them. It all happened very quickly, you know!" 2. I would have placed a large number of smoke generator units in the Southern façade of WTC7 - and turned them on maybe just a few minutes before the first collapse shown on TV at 9:59am (WTC2). Since these smoke generators would have to pump out smoke for the entire day, I would not have chosen to use mobile units parked around the WTC area (as suggested by Flabbergasted): someone might have wondered why the heck the smoke seemed to originate / emanate from street level - for hours on end. Instead, my story would be: "WTC7 was hit by debris. It caught fire. 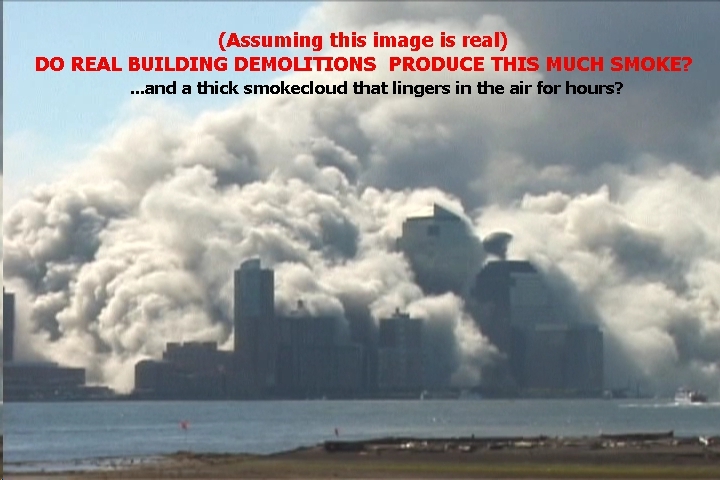 This is why you saw that huge smoke plume continuously gushing out of the Southern façade of WTC7 for the entire day". 3. As an extra 'safeguard' against any angry onlookers who'd question why they saw a smoke cloud appearing BEFORE the WTC2 9:59 collapse, I would roll out an actor (& former magician) such as Willy "BOOM" Rodriguez, the "WTC janitor" - whose story would be: "I HEARD BIG EXPLOSIONS IN THE TOWER BASEMENT BEFORE THE PLANES HIT!" 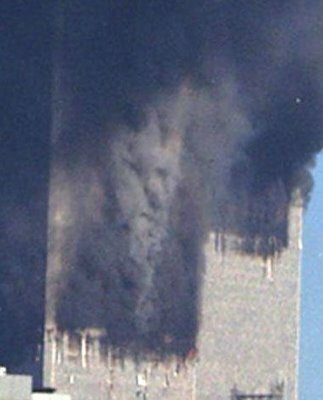 This would 'go to explain' why smoke was seen around the towers BEFORE they fell - and put to rest the few, observant onlookers who would complain about it. Only speculation, of course. But you may - hopefully - agree that it isn't totally wacky or outlandish. I'm not a magician / David Copperfield-type myself. I just think that such details would have been carefully worked out in the planning of this "in bright daylight" mass deception. "The magic lantern was not only a direct ancestor of the motion picture projector, but it could itself be used to project moving images, which was achieved by the use of various types of mechanical slides. Typically, two glass slides, one with the stationary part of the picture and the other with the part that was to move, would be placed one on top of the other and projected together, then the moving slide would be hand-operated, either directly or by means of a lever or other mechanism. " "There has been some debate about who the original inventor of the magic lantern is, but the most widely accepted theory is that Christiaan Huygens developed the original device in the late 1650s"
"In the 1660s, a man named Thomas Walgensten used his so-called "lantern of fear" [...] Johann Georg Schröpfer of Leipzig used the magic lantern to conjure up images of spirits on smoke." "The next famous conjurer to utilize the magic lantern was Etienne-Gaspard Robert. He was a Belgian inventor with an interest in magic. He began experimenting in the 1780s with techniques used to make phantasmagorias, which is basically the use of the magic lantern to conjure up supernatural images such as the devil, phantoms, or ghosts. If the images were projected onto a gauze screen, they would even seem to be floating in mid-air, making the stunt even more believable." I love this closing statement on wonkypedia: "Eventually, the magic lantern came to America. It continued to be used by magicians but also to project moving images for entertainment." Nothing changes and "Keeping it Simple Stupid". Images projected onto Smoke, Magic and Illusionists. I don't think you are too far off in your "Boom" analysis Simon. Last edited by brianv on Mon Sep 15, 2014 9:40 pm, edited 2 times in total. simonshack wrote: Oh, and by the way, let me just clarify one thing: YES, I do believe Manhattan was enveloped in smoke until dusk. Lots, and lots of smoke. In fact, far - far too much smoke to be possibly 'justified' by any sort of building collapse. I found this piece of info to baffle "9/11 Controlled Demo Truthers". It backs up your statement about how long it takes for dust to settle after a controlled demo. Can't wait to see their silly responses. How much dust will be created? No more dust will be created by implosion than would be by conventional demolition (crane/wrecking ball). The advantage to implosion is that the dust will be created during one specific short-term event. Therefore, appropriate precautions, such as covering heating and cooling systems and closing doors/windows, can be employed to protect surrounding areas from dust. If the two Towers were demolished conventionally, the process would take much longer to perform and these precautions would not be feasible for that extended period of time. In this implosion dust will be minimal because the building materials that are known to create excessive dust (furniture, masonry, plaster, drywall, wood) will be largely removed prior to implosion. Dust may linger in the immediate area for 5 to 10 minutes following the implosion. The extent the dust will travel depends on weather conditions and wind speed. Given the large vacant area surrounding the Towers, the majority of the dust will remain on the site. They even state the implosion of two towers. "Simon Shack of September Clues has always said all the video from 9/11 is fake! If you even suggested ANY real 9/11 imagery you would be banned from his site. It happened to many people. I personally was attacked for suggesting not all the video was fake. Well now he has done a complete 180! I wonder why? Will he unban people?? lol He goes on to say that tower 7 was demolished to cover up the evidence of the smoke machines. He even says there is real video of 7 and of the smoke plume,etc . Something we have always suggested. Listen for yourself. This was on his appearance on the Ab Irato show about 3 weeks ago." I am now fully satisfied that we did well to ban Brian Staveley from this forum. Whether he is a shill or not doesn't really matter - since he clearly is too damn stoopid to participate / let alone contribute in a cogent manner to the all-important image fakery debate. I made a mistake. I misinterpreted what you said on Ab Irato's show. Someone brought to my attention your post on it and after reading it and relistening to your audio I realize I made a huge mistake. I am not expecting a return email or anything. Just saying I'm sorry for an honest mistake and will be putting a retraction up right away and telling anyone I emailed I was mistaken. I thought you had changed your mind on it all being 100 percent fake. Careless mistake on my part. I was not attacking you for it though. If indeed you did change your mind on that as I thought I'm sure you can see how it would be worth noting.. I should have listened to it a few times before making that conclussion and then posting it.We may not agree or whatever but I am not about spreading lies or putting words in one's mouth. Your views are your views and I do not want to be the one misrepresenting anyone's opinion. I am putting a retraction up now. Just watching the 'Dr Mark Heath' footage again (I suppose it should be called perspective G)... I noticed a few things. Mark gets out his camera 'just in time' to catch the collapse & as he's videotaping the oncoming 'pyroclastic dust clouds' it becomes apparent that the scene becomes dusty & smoky far before the cloud actually arrives. Was CDI responsible for demolishing the WTC city block? In other words, a decent precedent for controlled demo companies working with Hollywood fiction writers — pre-2001 no less! Ab suggests that CDI may even be the company responsible for blowing the 9 buildings on the WTC block on September 11th, 2001. If so, that's a pretty useful lead. Let's keep it in mind. As we've often emphasized, completely victimless controlled demolitions of enormous structures occur all the time. But seeing a video of it actually happening doesn't just help you "get the picture" — it also makes you realize just how terrible the fake 9/11 "WTC collapse" special effects really are. Just look at more 1990's CDI demolitions on their channel to see what real demolitions look like.